On Friday last week, I had the sudden desire to cast on a Lollipop Bunny rabbit. My original pattern is worked in DK weight yarn, but being a toy one can, of course, have heaps of fun changing the size by using a different yarn. 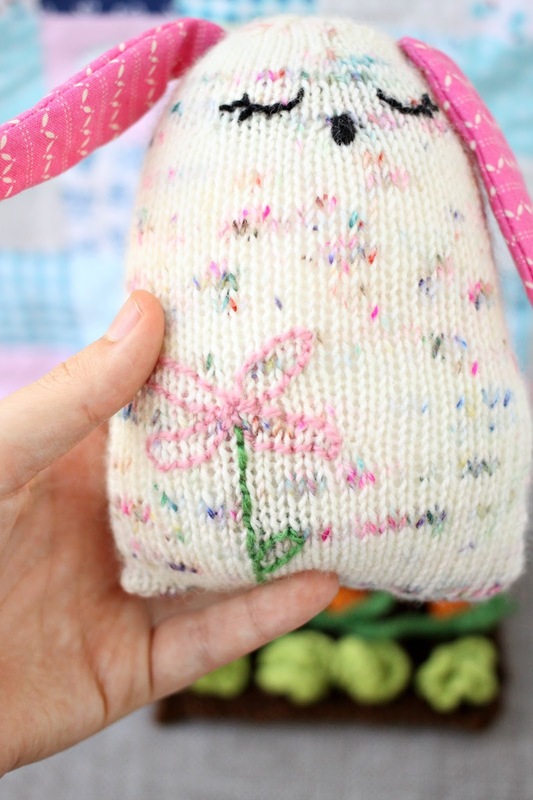 I wanted to make a bunny using some leftover sock yarn from my stash because the sound of a Sock Yarn Bunny appealed to me. As I cast on I planned on making a trio over the weekend - three little Sock Yarn Bunnies to have together. 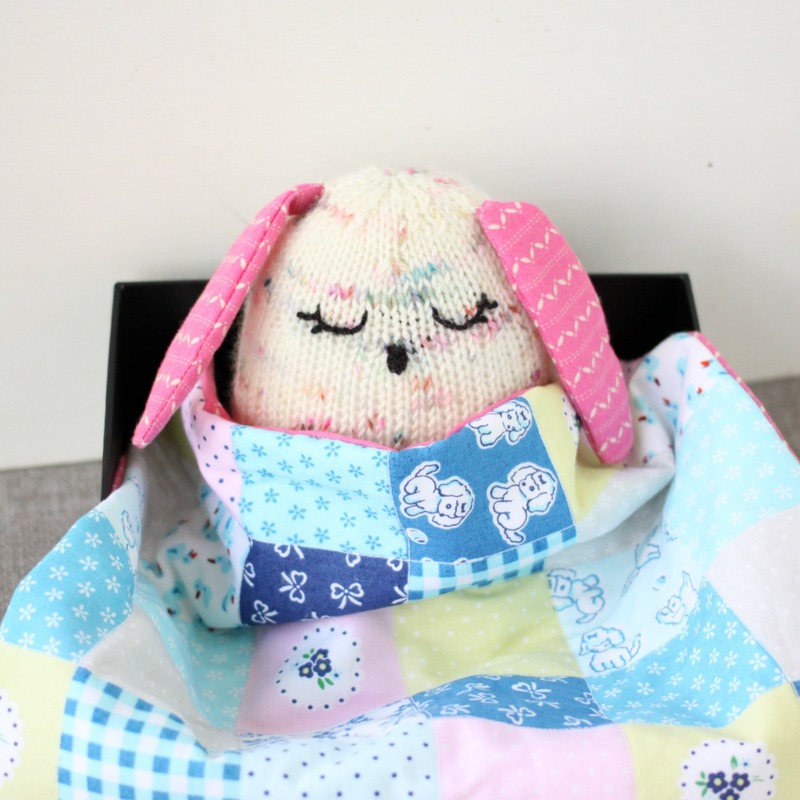 I was knitting away on my bunny and planning what kind of face to give her - I was feeling adventurous and wanted to do something outside of my ordinary toy face. So I decided she would have "closed" eyes, complete with eyelashes. When the time came, a nose was called for too. I also decided to do some more stitching on her and embroidered a simple little back-stitch flower on her body. It was lots of fun and I'm really pleased with the result. By the time I'd finished doing all of this, I no longer wanted to make more bunnies. I was having so much fun with this little miss that I wanted to keep adding to her. 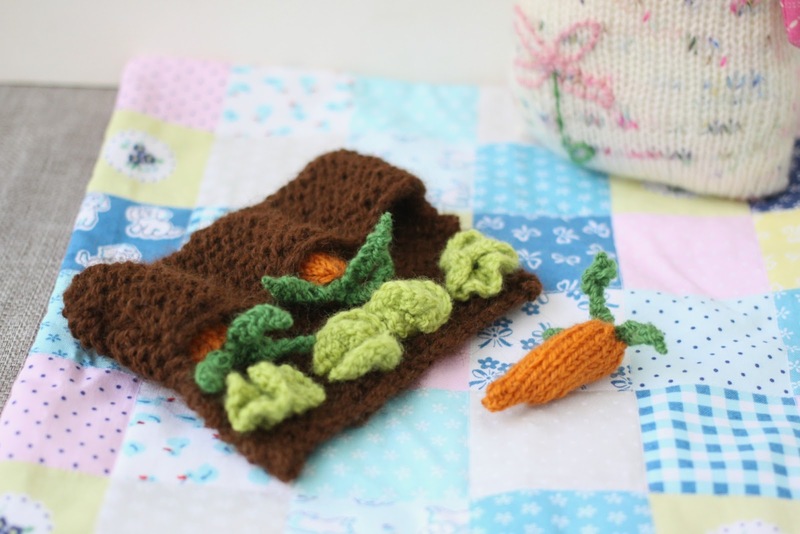 Carrots came to mind, quickly followed by a garden in which to plant them. 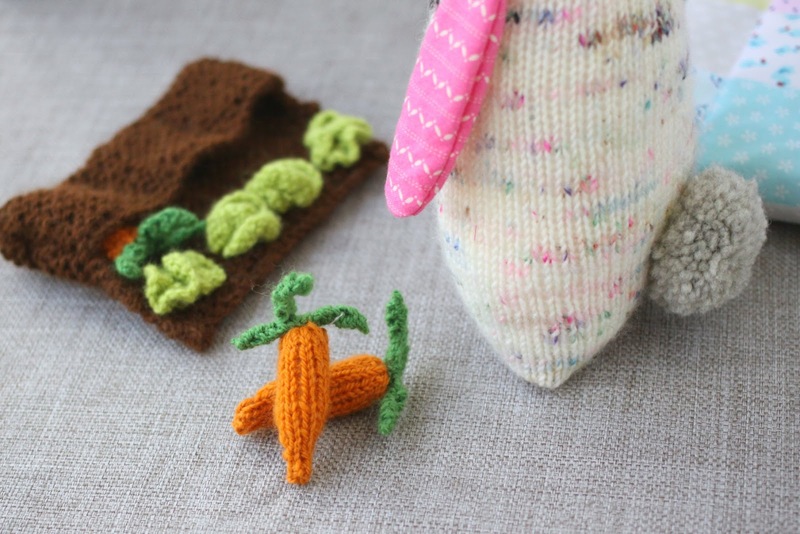 In the end, my Sock Yarn Bunny has ended up with three carrots, a garden in which they can be "planted", and a row of tasty lettuce. 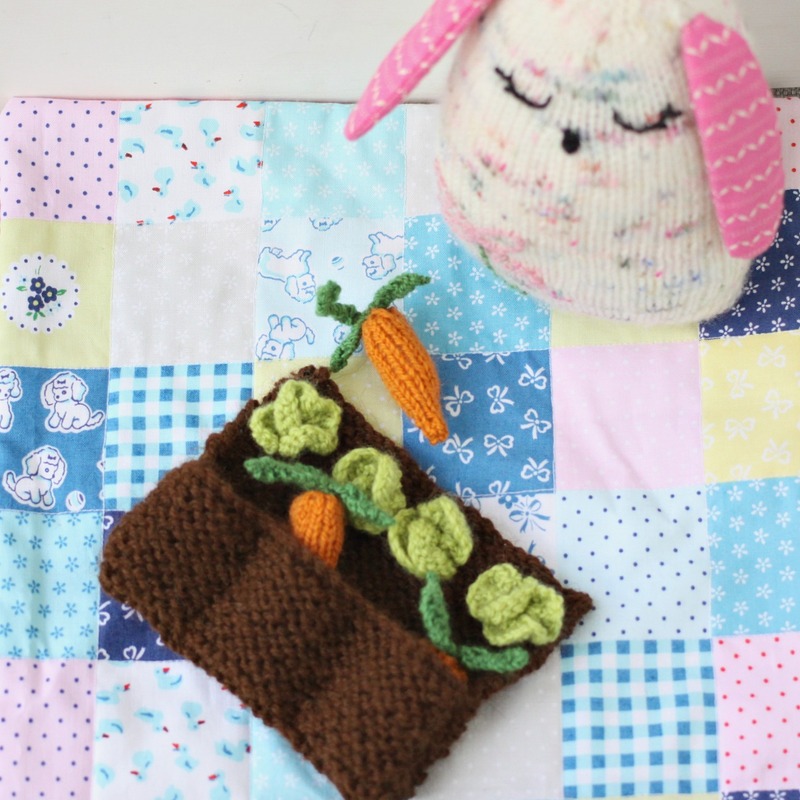 She also has a little blanket in which to snuggle into or enjoy her lunch of carrots on as a picnic rug. I had a bucket load of fun letting my imagination go where it wanted to with this project, and am so happy with how the whole set turned out. I'm really rather proud of it, actually. The carrots ended up being so much bigger than the lettuce by comparison, so I have decided that Bunny (who has yet to be named) grow them like that on purpose, to enter them into the local show for the Biggest Carrrot Prize. She's won first prize every year since she began entering her carrots 5 years ago. 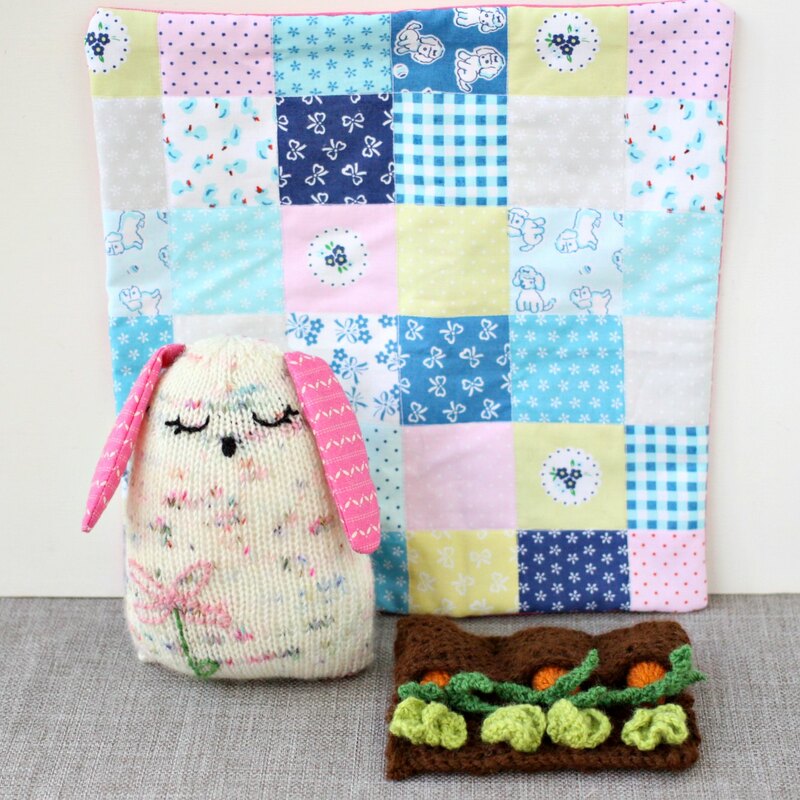 I haven't yet decided what to do with my Sock Yarn Bunny Set. I think I'm just going to appreciate her for a few days, and the right home for her will come along, whether that means giving her as a gift or putting her into my shop. I don't know what to name her. Do you have any ideas? I'm just going to mention it here too - I embroidered her eyes 4 times, and the eyelashes on her left eye took me another 5 goes to get right. So if you're new to toy making, don't worry if the face takes you a few attempts to master! I learnt years ago that I'm rarely happy with the face on a toy first time around, and it usually takes me 3 times to stitch the eyes before I get it right. And I've made a lot of toys over the years. Pattern: Made up by me, and scribbled in a notebook somewhere! Aww she is so cute!! 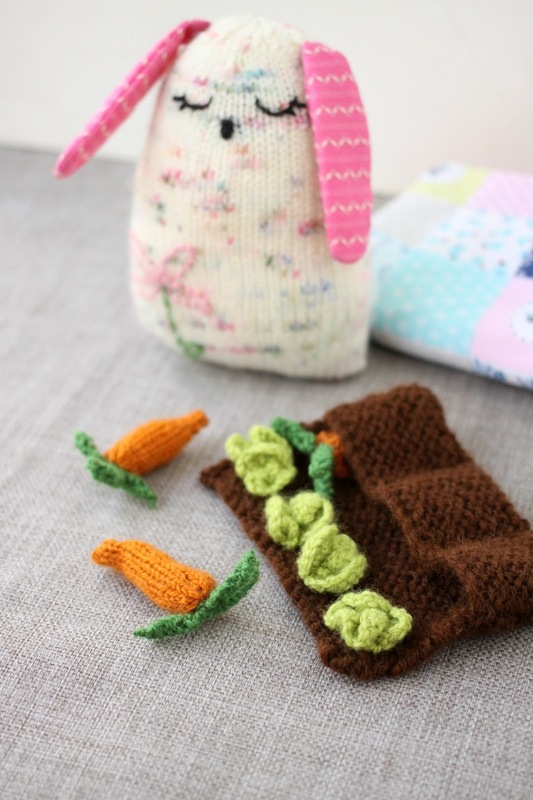 I love the carrots too - they look just perfect for a bunny to munch! I love the veggie garden! It is such a cute idea!